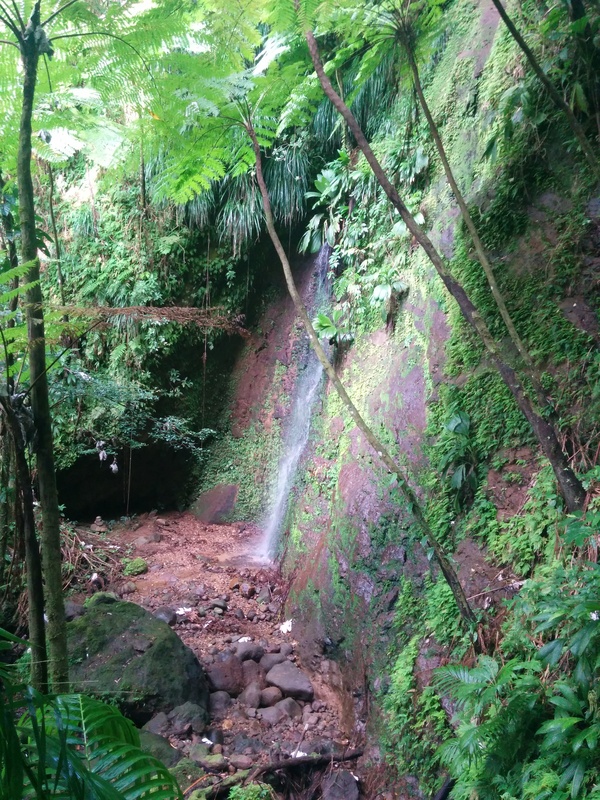 The hike to Lawyer Stephen’s cave and waterfalls is a quick, historic, and moderate hike that can be done by anyone with a moderate level of fitness, is kid and dog friendly. The hike can also be extended pass the first waterfall, from here it becomes an advanced and adventurous hike, requiring some scrambling, rope climbing and rock hopping, with the chance of getting wet. Especially during the rainy times of the year or after a recent heavy rainfall, the waterfalls should offer great views with flowing water and some fun rock hopping in the river on the upper section. The hike is named after James Stephen, a British abolitionist lawyer that fought to end the slave trade in the late 1700s. End of the dirt road and beginning of the trail. Look for the palm tree hiding in the trees. From the roundabout just north of the Caribbean Cinemas Complex continue north on the dirt road for around 1 mile. Turn left at a large brown cement building that is actually a huge water holding tank. Just after turning onto the road the first clearing opportunity for parking is on the right before the tank. If you have a capable vehicle, continuing on the road for as far as possible will take you closer to the beginning of the trail and save unnecessary walking. No matter where you park, continue towards the beginning of the trail by walking, jogging, biking or skipping up the dirt road. The road splits at a pig farm just after a small and unused water basin, but both will rejoin on the other side of the farm. Continue ascending the road, passing the round metal house with windmills until you reach a sharp right turn and a palm tree at the beginning of a forest. 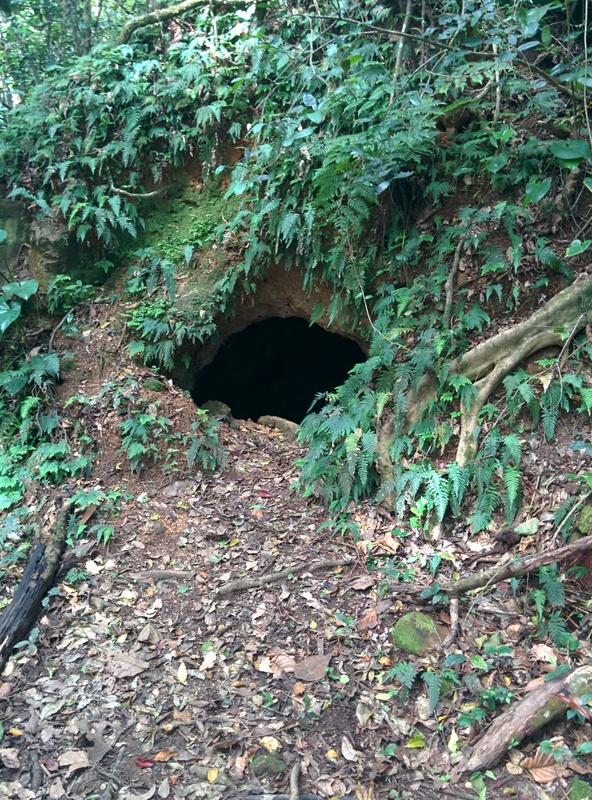 This is the entrance to the Lawyer Stephen’s Cave and Waterfalls. Once at the trailhead, look for the lone palm tree peeking just above the trees (see photo above) stay left aiming for the palm tree and you will find a small path in the tall grass and bushes. The trail is grown over quickly but the path through the grass is there, follow it, protecting your face from elastic branches through the bushes. The entire portion of the trail through the bushes is only 250 meters long and comes out into an open trail under the rainforest canopy. In the rainforest follow the trail, it will slowly ascend and eventually begin to follow a riverbed. 1000 m into the trail another trail will begin on the right, usually marked with various colored blazes, currently white and orange. trail you’ll quickly pass what looks like a cement bath tub on the left of the trail. The tub is also a sign that you may have missed the turn off for the cave, another reason to visit the cave on the way back instead. It’s only 200 meters from the cave turn off to the 1st waterfall. Climb down from the trail to the first waterfall and take a shower in the hopefully gushing waterfall (weather dependent). While the first waterfall usually has more water, the second waterfall is at least twice as high, and even more fun to get to. 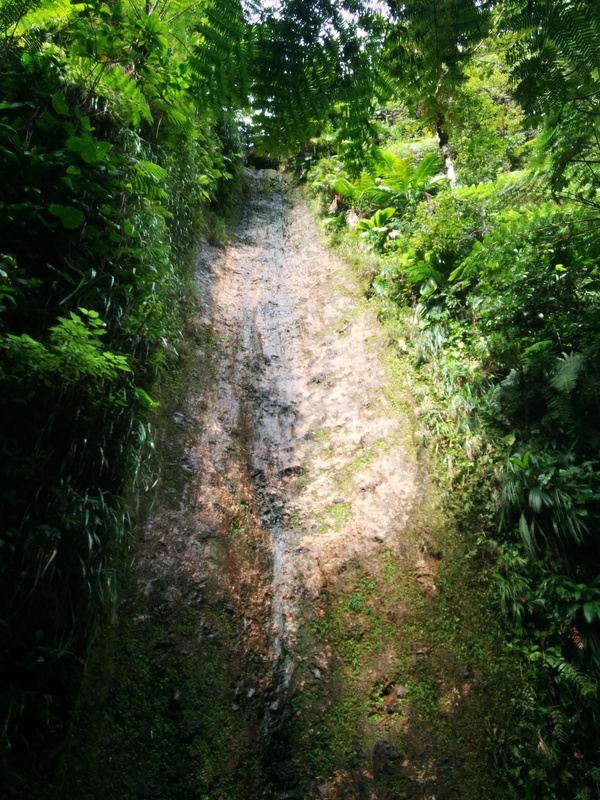 Getting to the second waterfall involves trail finding, rock hopping and possibly getting muddy and wet. Getting to the second waterfall can be tricky, but the river is your guide. The 2nd waterfall is directly upstream from the 1st and can be found by simply following the river upstream. That said some portions of the river are narrow, deep, or blocked by small rock walls, so detours off the river and through the adjacent rain forest are needed to get around the impassable sections. To get to the beginning of the second portion of the trail, climb back onto the main trail and climb up and around the right side of the 1st waterfall. 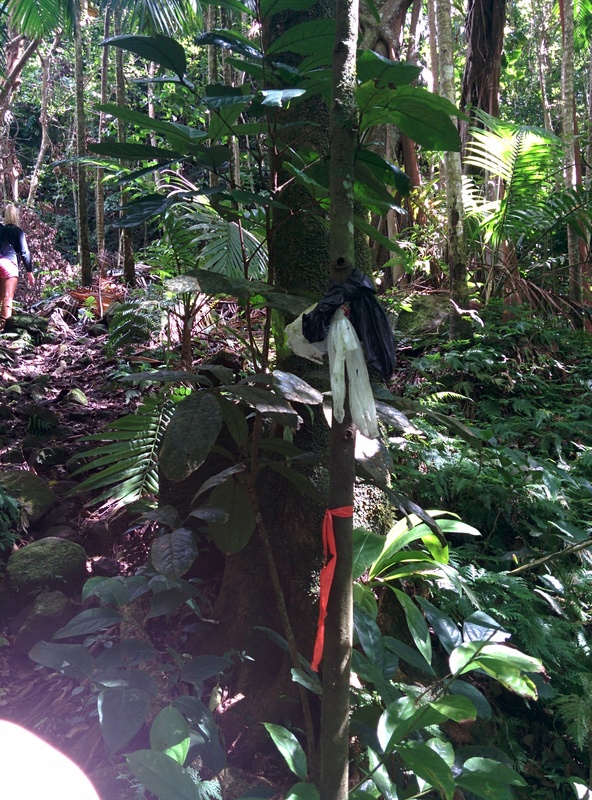 A black rope is in place to help send the first steep portion of the trail, after which there’s a quick trail to the top of the 1st waterfall. Return to the top of the rope to continue up with the help of roots and trees. The trail quickly directs you up and away from the river but then quickly turns back and descends back to the river. Join the river, hopping from rock to rock (or wading right through the icy pools) always following the river upstream. Along the river there will be a couple more obstacles that will force you back onto the trail just adjacent to the river, but eventually bringing you to the 2nd waterfall. Enjoy the waterfall. To get back to your hotel room, apartment, campus, or beach bar simply return the same way you came, visiting Lawyer Stephen’s Cave if you missed it the first time. 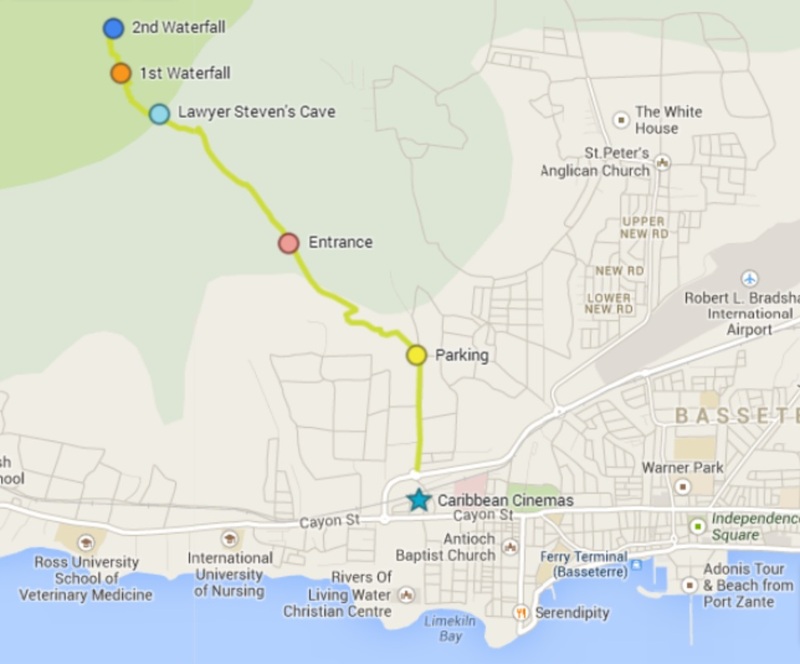 CLICK HERE TO DOWNLOAD THE GPS TRACK DATA FOR LAWYER STEPHEN’S CAVE AND WATERFALLS HIKE OR CHOOSE FROM THE BOX.NET FLASH WIDGET AT THE TOP OF THIS PAGE. James Stephen did not live in any cave. To suggest he did is rubbish. He had a wife and six children living in St. Kitts – Somebody has invented this story. It was most probably a man called James Stephens – note the word s, who lived there. Did this walk with a group of 12 last month when on holiday. The palm tree at the beginning has reduced to a stump so you need to keep your eyes peeled to start at the trailhead – have faith as you begin to plunge through the tall grass as the path is there! Lots of markers are still in place along the walk. The walk up to the cave turn off is fairly easy. It’s tricky and slippery to get up to the cave though as the path is mainly mud. First waterfall great but definitely worth the effort to get to waterfall 2. However the first very steep section is tricky as there is no longer a rope in place and is also muddy after rain. You need a decent pair of shoes. Once you’ve got there the section following the river is great fun and the second waterfall really high (although less water than the first one). My group loved it. 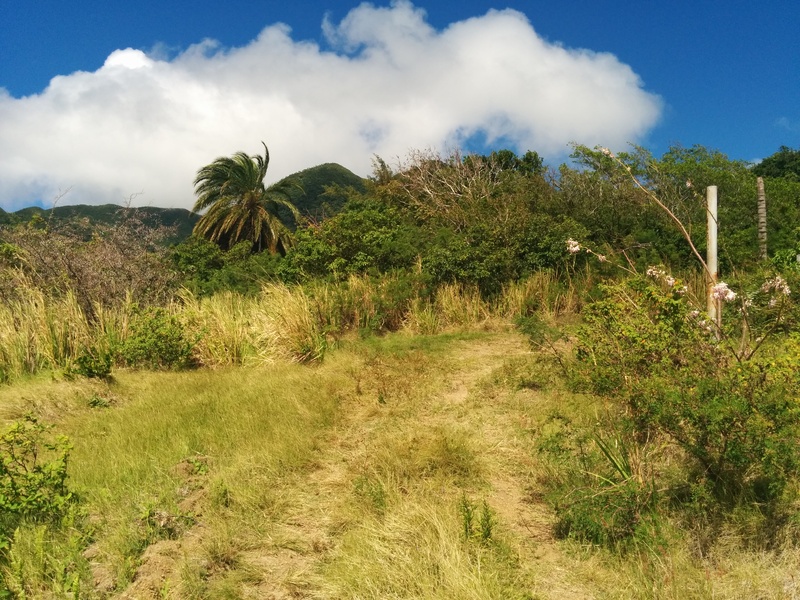 Thanks so much for putting this page together and supporting walking in st Kitts. Wouldn’t it be great if the government saw the potential for developing routes and trails for the locals and tourist markets? I tried to do this walk 2 weeks ago. The start was okay, and the palm tree was indeed reduced to a stump. However, after that, the track was full of dense vegetation on some parts and some trees had fallen down on the track (probably due to the hurricanes). After making my way up the track I got stuck at some point and decided to go back. Maybe with a good machete and some company, you could make it, but definitely not an easy walk anymore.